Pie and salad? Yes, that is basically what this is. I guess Melissa D'Arabian is taking over my blog for the time being. She does do a really nice job of creating recipes that are actually affordable. 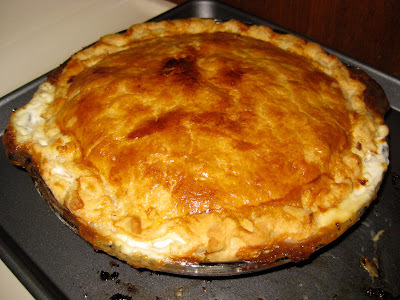 This torte is just a basic pie crust, filled with potatoes, swiss cheese, bacon and heavy cream. Believe it or not, the salad is key. The torte is rich and creamy and it tastes best when each bite has a little salad in it. 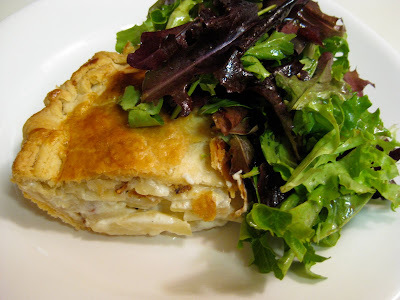 The acid from the balsamic dressing cuts into the heaviness of the torte perfectly. This version of a balsamic vinaigrette is one of my favorites. I might make it my staple balsamic vinaigrette recipe. If you have made pie crust before, this is a piece of cake to make. If you haven't, the most important thing when making pie crust is to keep the dough (mostly the butter in the dough) really cold. That is why the recipe says to use ice water and to keep putting the dough in the refrigerator. This is a great recipe for first-time pie crust makers, so give it a shot. I also recommend that you use a mandolin (1/16 inch setting) or food processor to slice the potatoes (for consistency), if you have one. I didn't because I was too lazy to get anything out. Lastly, this would be a great brunch meal but worked for dinner too. It looks kind of dainty, but the photo is what I ate and I was completely satisfied after eating it for dinner. I was worried about Scot, but he had twice as much torte and probably 4 times as much salad and was also satisfied. I always avoid making meals like this for Scot because he needs a lot of carbs to fill him up, but this worked. Rub the inside of a large wooden bowl with the garlic clove and then either discard it or save it for another use. Put the mustard in the bowl and whisk in the balsamic vinegar and soy sauce (a French secret!) vigorously for about 10 seconds to get a creamy consistency. Season with salt and pepper, to taste. Drizzle in the olive oil as slowly as possible with 1 hand while whisking as quickly as possible with the other hand to emulsify. Lay the salad greens on top of the dressing and toss just before serving. PS: Here is a pic of the entire torte. I didn't measure the cream and put a little too much in. It exploded over the sides, but that's fine. UPDATE: Actually, my genius friend pointed out the real reason it exploded...I forgot the steam holes!!! btw, if you find out how to become a real foodie, please let me know. ill do the same. Ooo, balsam is my fave. I want to try making it...include the recipe, too! Also nice pic of Scot chowing at the top. I didn't realize I hadn't included the salad recipe! Sorry, I just fixed that! I made the torte for dinner tonight and made my own Italian/Greek salad to go with it. I made my salad before I noticed yours was on here. The torte turned out good Cindy and I both liked it alot. I must confess though I used premade pie crust. yay! im glad you tried it! i was going to mention that you can just buy the crust, so im glad you did. it helps a lot with the labor.